Not even an apocalypse can stop the mail. Boldly go where no BionicBob edit has gone before; outside the Star Trek universe!. BionicBob has taken the critically maligned epic from Kevin Costner and stripped it down to its core, revealing optimistic tale of human triumph which is the core of this post-apocalyptic box-office mis-fire. Finally, The Postman delivers! My intention is to try and bring some LOVE to this wrongly maligned movie. 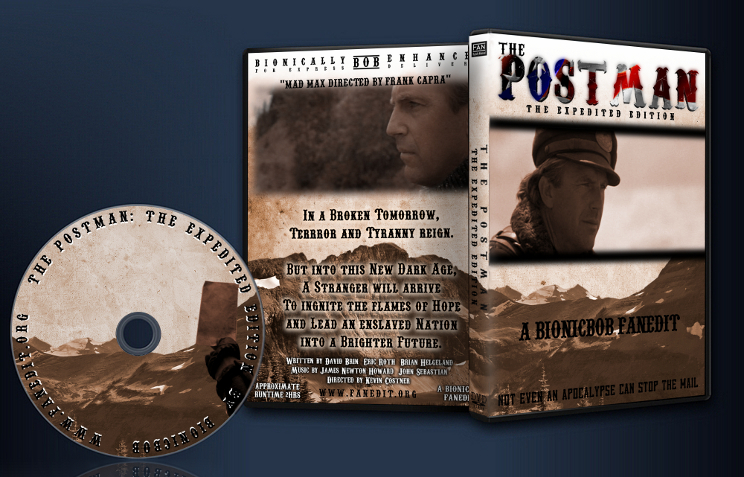 The original POSTMAN is a sentimental, lyrical, optimistic post-apocolyptic epic adventure about the power of love, hope and patriotism. But in 1997 no one was interested in an OPTIMISTIC post-apocaliptic adventure movie. Audiences and critics widely panned the movie. but I take it as wonderful compliment. Capra movies are inspiring patriotic tales of the common man rising up and triumphing over corruption and the more powerful. And at it’s core, so is the The Postman. It is a movie about HOPE. It is NOT a movie for cynics or pessimists. So with this edit, I have embraced the Capra-corn elements of unashamed patriotism, while adding an element of mystery by removing all scenes and/or dialogue that reveal the Postman’s true identity or history. Hopefully, by using this approach, you the viewer, will find the movie more engaging and entertaining. Remember, Not even an Apocalypse can stop the Mail! —Crafted a new prologue/opening credits. —Recut the Shelter in the Storm scene, so he no longer discovers the mail bag or uniform. Now it appears he is just taking shelter and drying out his uniform and mail. —Lots of little cuts/trims while in Pine View in attempts to make it less clear his true identity or motivies. —a few trims during the Benning, Oregon scenes…. —cut the whole cliche Hollywood ending of the defeated Badguy suddenly rising up and then getting shot by another character. Video 10/10. Audio 10/10. Editing 10/10. I love the theatrical release and I was really looking forward to seeing this fanedited version. Overall, I was not disappointed with it and in future, would probably watch the fanedit before I watched the theatrical. That said, the opening sequence, while expertly conceived and edited, did instantly make me feel like I was watching a fanedit. However, as soon as this is out of the way, the story sucked me back in and it plays out brilliantly and if I had never seen the theatrical, I would never have believed that everything after the intro was a fanedit. It’s superbly done! Also, I much, much, prefer the new ending and that’s probably the main reason I would watch this instead of the theatrical. I watched this on my computers 19″ LCD monitor, with the audio coming through some cheap PC speakers. I had the sound turned way up and noticed no glitches in either video or audio. I have to give this a high score because I enjoyed it so much. Great edit! The Postman: Expedited Edition = 9/10. The Picture quality of this release is on par with the original DVD presentation. No discernible loss of picture fidelity throughout. The audio presentation of this film is, likewise, on par with the original DVD. No noticeable pops or hard cuts in the audio track during the edit. This edit is fairly successful in realizing the editors intent. The film is much more streamlined and focused than its meandering original. The story does not suffer from the cuts made while the emotional content is greatly enhanced by this new focus. The original film had a number of threads and themes it was working with, and it can be argued that because of this it never truly delivered powerfully on any of them. By focussing in on the core of the story, Bob has created a version of the film that will connect with the audience in a much more profound and emotional way. That said, there are one or two places in this edit where too much information may have been excised. The final confrontation between the Postman and the leader of the Holnists will likely leave some audience members scratching their heads as the characters make references to things the audience never saw. I imagine this won’t be a major hurdle however and most people will merely assume the characters to be referencing a shared history that we are not and don’t have to be privy too. Lastly, the ambiguous nature of the postman is never resolved, and while this won’t bother most viewers, it doesn work against one of the central themes of the film on both versions, the exploration of the “noble” lie. Much of that still remains in the film with Ford Lincoln Mercury amd in the final confrontation when the Postman declares to Bethlehem that they are both frauds. In the opening title cards there’s a typo: Goverment instead of Government. I noticed from Bridgetown through the end of the film that the lip synch seemed to go off. I found it especially noticeable when Tom Petty was about to send the Postman across the damn on that basket zip line thing. I tested the disc on 2 different PS3s, my computer drive and a standard DVD player and found this issue on all of them. A highly enjoyable edit I would happily reccommend to anyone. 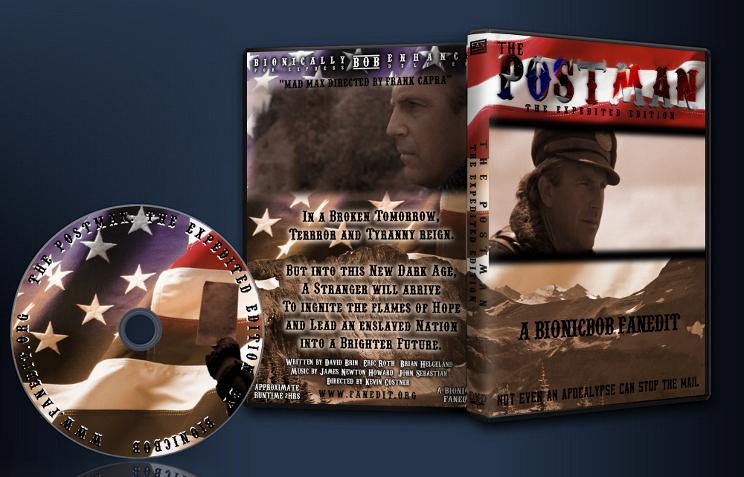 I remember quite vividly the outpour of negativity which was lauded against Kevin Costner’s epic adaptation of David Brin’s novel, The Postman. It seemed that after the huge success of movies like Dances With Wolves, JFK, The Bodyguard, A Perfect World and Robin Hood: Prince Of Thieves, the media at large were just waiting for Costner to fall from grace. The much touted production problems of Waterworld in 1995 started the ball rolling, and two years later nearly everyone seemed to rub their hands together with glee when The Postman cemented the opinion that he had lost the plot and produced an overblown project of vanity which many would consider to be the worst film of that decade. By the time I managed to catch up with the film, about a couple of years later, I came to the conclusion that the criticism was deserved and yet at the same time wasn’t. The film certainly had problems. The first half of the 3 hour epic was somewhat ponderous, slowly setting up the story at large and in particular painting Costner’s character as far too much of a con man for my liking. Sure, Dances With Wolves was a slow burner of a movie, but it had more focus in its direction then Costner shows here. However, amongst this was a movie with a good natured message about a hero who stood as a symbol of hope and patriotism during a time when pessimism ruled – not only in the time when the movie was set, but during the time it was released too. Ultimately, this was far from the worst film of the decade, but yes it certainly could have been a whole lot better. 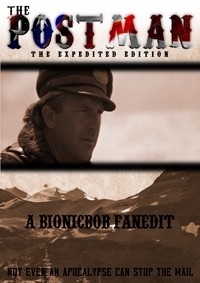 When BionicBob somewhat sheepishly released his fanedit, entitled The Postman: The Expedited Edition, I was very intrigued to see what he had come up with; particularly when I read his cutlist. The first thing which grabbed me straight away was the intention to make Costner’s Postman character far more of a mysterious figure; the second was excising almost the first hour of the movie. Both of which made me very eager to see the edit. Bob begins the edit with a summary of what’s gone before, relayed to us by onscreen captions and images, which tell of how social collapse around the world and nuclear war has more or less left society on its knees. It also briefly introduces the neo-fascist group known as The Holnists, led by a wonderfully stary eyed Will Patton, and then we pick up Costner as he seeks shelter from the rain for the night and then turns up at a settlement the next morning claiming to to be a Postman from the reformed Government of the United States of America. A perfect way to start for me, and already it creates far more mystery as to the authenticity of The Postman’s claims and the actions he takes thereafter. Throughout the edit Bob neatly keeps things moving at a far brisker pace than the theatrical cut, but never at the expense of key scenes which help build character or enhance the story. It wasn’t long before I was already half way through the edit and thought how quickly it had breezed past. By concentrating on the central theme to do with the hope and purpose which The Postman brings to numerous communities, the film takes on a far more focused and powerful meaning. Strengthening this further is the decision to leave it far more open to the viewer’s discretion in relation to Costner’s character – in what motivates him, to whether he is a real Postman or just some kind of con man. Less is more indeed. Technically, on the whole this is a top notch effort. The picture quality is more or less every bit as good as the official DVD release, and the audio levels are all fine. Only towards the end did I notice a problem where the lip synching seemed to be slightly out of time, which is a shame as otherwise this is a near flawless technical edit. So, video would be 10/10, audio 8/10. Overall, I would give this a final score of 9/10. Well done Bob.